Dr. Mark Duggan, a Clark Street adopter, University of Chicago economist and PAWS volunteer, reached out to find more about euthanasia trends in the city. After a robust conversation, Paula recruited him to help evaluate data from the city of Chicago around the source of stray calls. This would help them develop the best spay/neuter strategy. They found that most stray calls were concentrated on the South Side of the city, where there were no veterinary clinics and limited pet and financial resources. Paula and Peter had a large bank branch in the Little Village neighborhood, in the heart of the high-stray communities of Chicago. 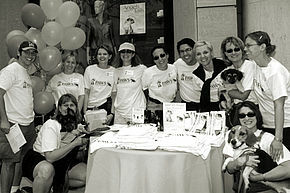 Their business again donated free space to open a spay/neuter clinic. Early supporters, including Ann Lurie, Howard Draft and Jamie and Marshall Field, donated to support the build-out of the Clinic. 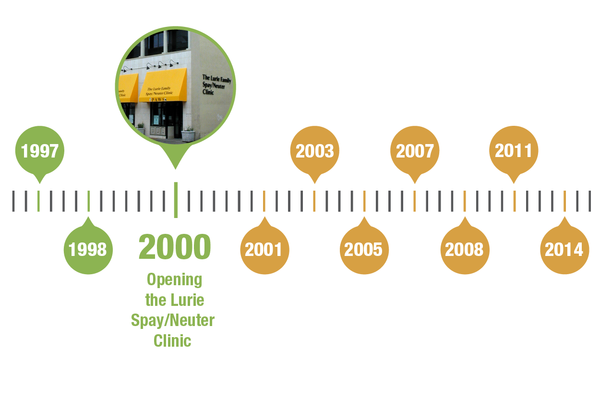 In November 2000, the Lurie Clinic opened its doors, providing free and low-cost spay/neuter surgeries for pets of families in under-resourced communities who could not otherwise afford it. Today, it is the largest clinic of its kind in the Midwest, performing more than 17,000 surgeries each year.